Soag were approached by an end customer to provide an upgrade to an electrical control panel for a Herbert No4 lathe. The original control panel, designed in the late 50’s, was becoming troublesome and dangerous. Also the customer was concerned that the panel did not conform to the latest safety regulations, compromising the safety of the operator. A new system was designed, based on original machine functionality, but utilizing modern components and the latest safety standards for machines of this type. New electrical wiring diagrams were designed and created on EPLAN Electric P8, detailing layout and product parts. 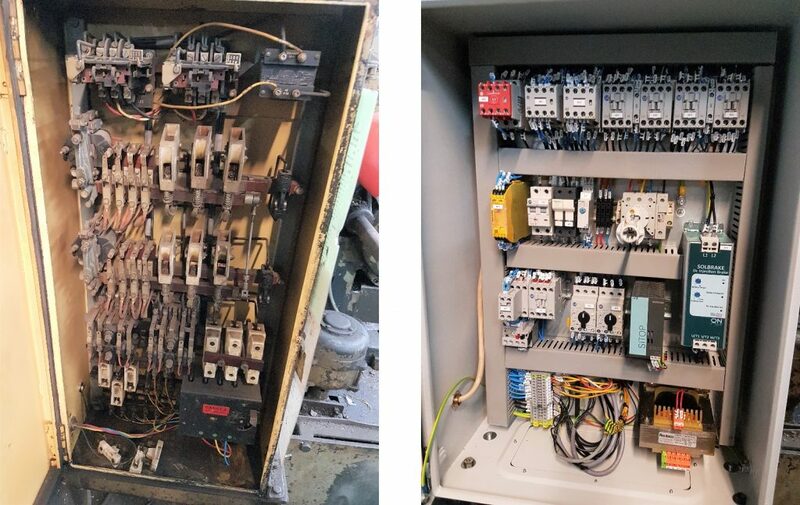 The existing obsolete electrical control gear panel was removed and replaced with a new fully IP rated control cabinet, new modern control gear, safety monitoring relay confirming to the latest safety standards, and the addition of the added functionality of a DC injection braking unit, enabling controlled stopping of main drive motor. The new control panel was manufactured off site, and installed in one day, with minimum downtime disruption to production.